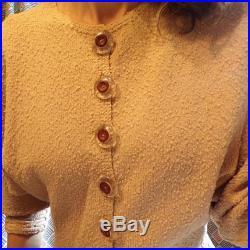 Beautiful sweater-knit vintage set nubbly texture, maybe cotton, doesn't feel like wool, especially the skirt. 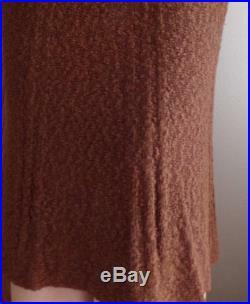 Pull-on skirt in chestnut brown, and beige cardigan. 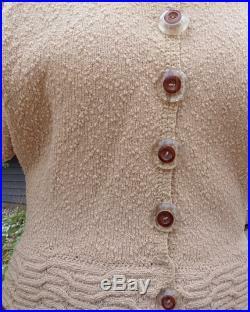 The cardigan has amazing buttons, clear with woodgrain look centers. The skirt is more size xs, and the cardigan is loose in the bust, so has a little more flexibility in size. Please compare the measurements below with pieces you have at home that fit well.